University of Allahabad, oldest among all central universities in India. Central universities or union universities in India are established by an Act of Parliament and are under the purview of the Department of Higher Education in the Union Human Resource Development Ministry. In general, universities in India are recognised by the University Grants Commission (UGC), which draws its power from the University Grants Commission Act, 1956. In addition, 15 Professional Councils are established, controlling different aspects of accreditation and coordination. Central universities, in addition, are covered by the Central Universities Act, 2009, which regulates their purpose, powers, governance etc., and established 12 new universities. The list of central universities published by the UGC lists 49 central universities, as of 12 December 2018[update], nine of which are directly funded by the Government of India and are not under the purview of the UGC. State universities are run by the state government of each of the states and territories of India, and are usually established by a local legislative assembly act. Deemed university, or "Deemed-to-be-University", is a status of autonomy granted by the Department of Higher Education on the advice of the UGC, under Section 3 of UGC Act, 1956. Private universities are approved by the UGC. They can grant degrees but they are not allowed to have off-campus affiliated colleges. Apart from the above universities, other institutions are granted the permission to autonomously award degrees. These institutes do not affiliate colleges and are not officially called "universities" but "autonomous organisations" or "autonomous institutes". They fall under the administrative control of the Department of Higher Education. These organisations include the Indian Institutes of Technology, the National Institutes of Technology, the Indian Institutes of Science Education and Research, the Indian Institutes of Engineering Science and Technology, the Indian Institutes of Management (though these award diplomas, not degrees), the National Law Schools, the All India Institute of Medical Sciences, and other autonomous institutes. The region with the most central universities in India is Uttar Pradesh with six universities, namely Allahabad University,Allahabad ,Aligarh Muslim University,Aligarh, Banaras Hindu University,Varanasi Babasaheb Bhimrao Ambedkar University,Lucknow , Rajiv Gandhi National Aviation University,Amethi and Rani Lakshmi Bai Central Agricultural University,Jhansi. There are central universities in all of the states of India except Goa. Of the union territories, there are central universities in Delhi and Puducherry. The University of Delhi is one of the five central universities in Delhi. Main gate of the Banaras Hindu University. ^ "Central Universities". mhrd.gov.in. Union Human Resource Development Ministry. Archived from the original on 3 March 2012. Retrieved 13 March 2012. ^ "UGC Act-1956" (PDF). mhrd.gov.in/. Secretary, University Grants Commission. Retrieved 31 March 2016. ^ "Professional Councils". ugc.ac.in. University Grants Commission. Retrieved 11 September 2017. ^ a b "Central Universities Act, 2009" (PDF). Central University of Karnataka. Retrieved 14 August 2016. ^ a b c "Consolidated list of Central Universities as on 12.12.2018" (PDF). UGC. 12 December 2018. Retrieved 13 January 2019. ^ "State Universities". ugc.ac.in. University Grants Commission. Retrieved 1 July 2017. ^ "Deemed Universities". ugc.ac.in. University Grants Commission. Retrieved 1 July 2017. ^ "List of Institutions of higher education which have been declared as Deemed to be Universities (as on 29.06.2017)" (PDF). ugc.ac.in. University Grants Commission. 29 June 2017. Retrieved 1 July 2017. ^ "Private Universities". ugc.ac.in. University Grants Commission. Retrieved 1 July 2017. ^ "State-wise List of Private Universities as on 29.06.2017" (PDF). ugc.ac.in. University Grants Commission. 29 June 2017. Retrieved 1 July 2017. ^ "Autonomous Bodies – Higher Education". education.nic.in. Union Human Resource Development Ministry. Archived from the original on 17 December 2010. Retrieved 30 June 2011. ^ Mathang Seshagiri (1 May 2011). "It's time IIMs give degree, not diploma: Panel". articles.timesofindia.indiatimes.com. Times of India. ^ "About RGU". rgu.ac.in. Rajiv Gandhi University. Retrieved 26 June 2011. ^ "Assam University". aus.ac.in. Assam University. Archived from the original on 4 September 2011. Retrieved 27 June 2011. ^ "Welcome to Tezpur University". tezu.ernet.in. Tezpur University. Retrieved 27 June 2011. ^ ":: Central University Of Bihar ::". cub.ac.in. Central University of Bihar. Retrieved 28 June 2011. ^ "About Pusa". rpcau.ac.in. Dr. Rajendra Prasad Central Agriculture University. Retrieved 13 January 2019. ^ "Guru Ghasidas University". ggu.ac.in. Guru Ghasidas Vishwavidyalaya. Retrieved 29 June 2011. ^ "Indira Gandhi National Open University". ignou.ac.in. Indira Gandhi National Open University. Archived from the original on 24 October 2009. Retrieved 29 June 2011. ^ "History of Jamia Millia Islamia". jmi.ac.in. Jamia Millia Islamia University. Archived from the original on 2 July 2011. Retrieved 29 June 2011. ^ "Welcome to Jawaharlal Nehru University". jnu.ac.in. Jawaharlal Nehru University. Archived from the original on 2 July 2011. Retrieved 29 June 2011. ^ "About the University". sau.int. South Asian University. Retrieved 14 August 2016. ^ "About us". du.ac.in. University of Delhi. Retrieved 29 June 2011. ^ "Central University of Gujarat". cug.ac.in. Central University of Gujarat. Retrieved 29 June 2011. ^ "Central University of Haryana". cuharyana.org. Central University of Haryana. Retrieved 3 July 2011. ^ "Central University of Himachal Pradesh". cuhimachal.ac.in. Central University of Himachal Pradesh. Retrieved 18 July 2011. ^ "Welcome To The Official Website | Central University of Jammu". cujammu.ac.in. Central University of Jammu. Retrieved 24 November 2013. ^ "Welcome To The Official Website | Central University of Kashmir". cukashmir.ac.in. Central University of Kashmir. Archived from the original on 30 August 2011. Retrieved 19 July 2011. ^ "About CUJ". cuj.ac.in. Central University of Jharkhand. Archived from the original on 25 June 2011. Retrieved 20 July 2011. ^ "About CUK". cuk.ac.in. Central University of Karnataka. Archived from the original on 21 July 2011. Retrieved 21 July 2011. ^ "Official Website of Central University of Kerala". cukerala.ac.in. Central University of Kerala. Archived from the original on 24 July 2011. Retrieved 7 August 2011. ^ "The University Profile". dhsgsu.ac.in. Dr. Hari Singh Gour University. Retrieved 20 September 2017. ^ "Indira Gandhi National Tribal University". igntu.nic.in. Indira Gandhi National Tribal University. Archived from the original on 2 September 2011. Retrieved 29 August 2011. ^ "Mahatma Gandhi Antarrashtriya Hindi Vishwavidyalaya". hindivishwa.org. 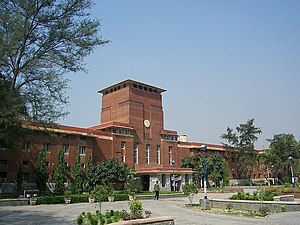 Mahatma Gandhi Antarrashtriya Hindi Vishwavidyalaya. Retrieved 30 August 2011. ^ "Central Agricultural University". dare.nic.in. Central Agricultural University. Archived from the original on 21 July 2011. Retrieved 24 July 2011. ^ "Manipur University". manipuruniv.ac.in. Manipur University. Archived from the original on 22 July 2011. Retrieved 24 July 2011. ^ "About NSU". nsu.ac.in. National Sports University. Retrieved 13 January 2019. ^ "History of North-Eastern Hill University, Shillong-22". nehu.ac.in. North Eastern Hill University. Retrieved 24 July 2011. ^ "About Mizoram University". mzu.edu.in. Mizoram University. Archived from the original on 14 July 2011. Retrieved 24 July 2011. ^ "Welcome to Nagaland University Home Page". nagauniv.org.in. Nagaland University. Retrieved 30 August 2011. ^ "Introduction". cuorissa.org. Central University of Orissa. Archived from the original on 28 May 2011. Retrieved 30 August 2011. ^ "About the University | Pondicherry University". pondiuni.edu.in. Pondicherry University. Retrieved 1 August 2011. ^ "CUP Profile". centralunipunjab.com. Central University of Punjab. Archived from the original on 5 August 2011. Retrieved 3 August 2011. ^ "About University". curaj.ac.in. Central University of Rajasthan. Retrieved 24 July 2011. ^ "Welcome to Sikkim University". sikkimuniversity.in. Sikkim University. Archived from the original on 28 June 2011. Retrieved 9 June 2011. ^ "Central University of Tamil Nadu, Thiruvarur". tiruvarur.tn.nic.in. Central University of Tamil Nadu. Archived from the original on 30 April 2010. Retrieved 27 July 2011. ^ "About Us". imu.tn.nic.in. Indian Maritime University. Archived from the original on 21 July 2011. Retrieved 27 July 2011. ^ "EFL University". efluniversity.ac.in. English and Foreign Languages University. Archived from the original on 31 May 2011. Retrieved 27 May 2011. ^ "University Act". manuu.ac.in. Maulana Azad National Urdu University. Archived from the original on 12 June 2011. Retrieved 24 June 2011. ^ "Right of Information | Uoh". uohyd.ernet.in. University of Hyderabad. Archived from the original on 20 June 2011. Retrieved 26 June 2011. ^ "About_More". tripurauniv.in. Tripura University. Retrieved 28 July 2011. ^ "Aligarh Muslim University". amu.ac.in. Aligarh Muslim University. Archived from the original on 1 September 2011. Retrieved 28 July 2011. ^ "History". allduniv.ac.in. Allahabad University. Archived from the original on 30 April 2008. Retrieved 28 July 2011. ^ "BBAU, Lucknow". bbauindia.org. Babasaheb Bhimrao Ambedkar University. Archived from the original on 10 August 2011. Retrieved 28 July 2011. ^ "History of BHU". bhu.ac.in. Banaras Hindu University. Archived from the original on 23 September 2015. Retrieved 28 July 2011. ^ "RLBCAU History". Rani Lakshmi Bai Central Agricultural University. Retrieved 1 July 2017. ^ "Hemwati Nandan Bahuguna Garhwal University – HNBGU | About the University". hnbgu.ac.in. Hemwati Nandan Bahuguna Garhwal University. Archived from the original on 27 July 2011. Retrieved 31 July 2011. ^ "Heritage". visva-bharati.ac.in. Visva-Bharati University. Archived from the original on 1 July 2011. Retrieved 1 August 2011. ^ "THE SOUTH ASIAN UNIVERSITY ACT, 2008" (PDF). Archived from the original (PDF) on 21 August 2016. Retrieved 16 August 2016. ^ "THE NALANDA UNIVERSITY ACT, 2010" (PDF). Archived from the original (PDF) on 4 January 2017. Retrieved 16 August 2016. Wikimedia Commons has media related to Central University, India.